Following minor growth in 2011, we have seen similar development in salaries over the past 12 months as the GFC continues to have an impact along with rising domestic costs affecting disposable income. Marketing Managers in particular are showing a reasonable increase but only for those experienced in and managing the new sophisticated tiered gaming loyalty programs and the new marketing paradigms of social networking, digital communication and database management. The areas that are showing softer increases are those in food and beverage, possibly a reflection of the downturn in tourism industry and with more staff looking for positions in these areas. DWS Hospitality Specialists have found a continuing increase in the number and quality of candidates applying for positions in the club industry, this in itself may be a contributing factor to the stabilisation of management salaries over the last two years. Critical staff shortage for chefs in the industry in previous years also seem to be easing as more chefs recognise the career opportunities in the club industry and clubs are recognising the level of remuneration necessary to attract competent qualified chefs to our industry. The trend towards tertiary qualifications is continuing to be a prerequisite in many club positions for General Managers, Finance Managers, Human Resource Managers and Marketing Managers. This is recognition of the increased management responsibilities, skills and professionalism required in our industry. 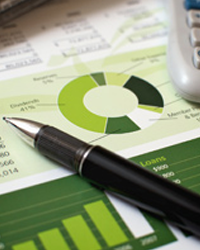 This demand for higher qualifications naturally impacts on salary expectations. The pool of skilled senior management has increased significantly in the Queensland club industry over the last ten years, largely through home State based education and development. I can think of at least 20 General Managers who have university qualifications in business and numerous accounting and operation managers who have similar qualifications, in addition to the many middle operational staff that have completed diplomas in club management through various areas such as the Foster Leadership Academy Program. I continue to deliver lectures at the University of Queensland and in my most recent lecture, I met a young student who is working in the club industry and in the third year of his degree. He started his training whilst working at the Club with Club Training Australia and that motivated him to increase his knowledge and gain formal qualifications. I don’t think I could find a better endorsement for what we do than that. The salary averages table at the end of this report is generated from information from over 40 management recruitment positions, numerous club salary reviews and management restructure over the last 12 months and DWS’ empirical evidence. 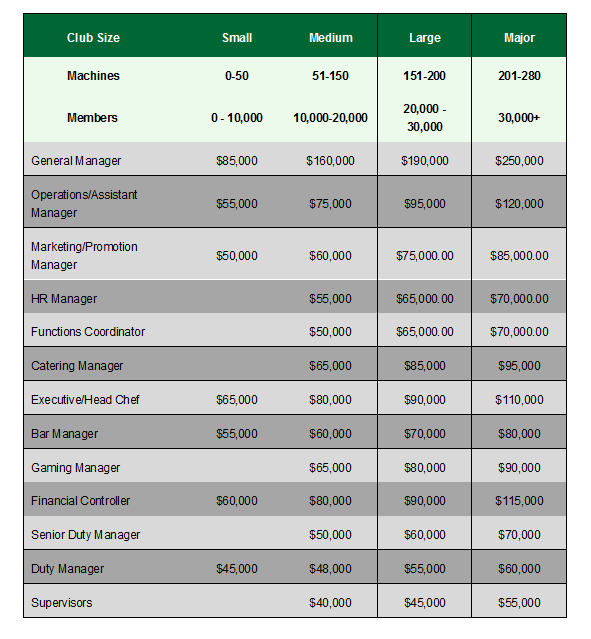 It indicates the various salary averages paid in clubs of varying sizes. Whilst these averages should not be taken in isolation from a club’s own situation, it does provide a general guide. Facts relevant to individual clubs that should be considered are profitable performance, qualification and experience of a particular candidate and the needs of the club. There are many examples of staff being underpaid and lost by the club and examples of poor staff being over paid and tending not to leave. Inflation over a given period is a key measurement element when reviewing remuneration. While inflation adjustments maintain a relative dollar value, it does not recognise increased responsibilities, or more importantly in today’s climate, market value. CPI increases in the Brisbane region for the financial year ending June 2012 have been in the order of 0.9%. The liquor and gaming industry continues to grow in Queensland, significant changes have been endured through various levels of government including Federal, State and Local Government. These regulatory requirements have continued to increase particularly in the areas of gaming compliance, responsible service of gaming, licensing division compliance, responsible service of alcohol, corporate governance, food hygiene, the privacy act, industrial relations and workplace health and safety. The last 12 month period has seen significant increases in AUSTRAC and OH&S regulations. Both State and Federal Governments appear to be continually reviewing and proposing regulatory changes. The unrelenting issues surrounding problem gambling continues to drive harm minimisation which has required significant involvement from club management dealing with community leaders and politicians relating to the operation of media campaigns to defend the club industry. There has been further implementation of the new Fair Work Act National Standards for OH&S, as opposed to the current State-based legislation requiring a total review of OH&S processes and procedures. This in itself has created extra burdens for Club Managers and operational management. The administration of the vast majority of the current and future regulations is the responsibility of the Club’s senior manager, particularly the General Manager. Any senior management staff remuneration should recognise the continuing increase in regulatory responsibility. 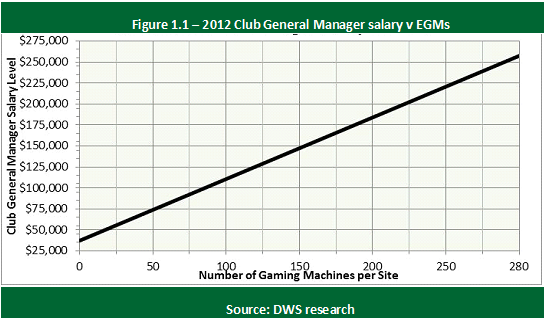 The following graph reflects the average General Manager’s earnings over the number of gaming machines regularly monitored by DWS. As much as was possible, this graph has endeavoured to gross up the total remuneration value of remuneration packages, not just base dollar salary levels. While this provides a guide, the number of poker machines alone should not be seen as the sole determining factor in a General Manager’s salary. This graph produces a salary average formula of approximately $1,000 per machine. This figure is higher in the lower range of machine numbers and conversely the salary is lower in the high machine numbers. Happy to discuss some of the services that DWS can offer you with regards to hospitality management recruitment, conducting remuneration reviews for management staff or performance reviews.